The innovative, weed control, Flame Retardant groundcover fabric has been launched by Thrace Group, breaking new ground in fire safety. The FR Groundcover is a new groundcover fabric specially designed to effectively prevent the spread of fire· it is self-extinguishing, highly UV-stable and has the ability to inhibit and delay ignition, therefore helping to create a safer growing environment. The MED Greenhouses project is being held within the framework of InterregMED 2014-2020 programme and under the title «Green Growth through the capitalization of Innovative Greenhouses». Its objective is to start a dialogue between institutions, companies and relevant bodies, in favor of the construction of innovative greenhouse systems in the Mediterranean basin. 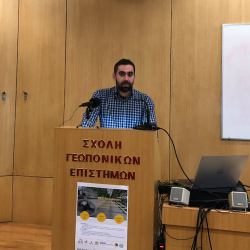 The presentation was held on Friday 12th of October by Mr. Nikos Kadoglou, Agronomist, MSc., Technical Support Specialist - Agri Division of Thrace NG,at the amphitheater of the Dept. of the Agriculture, Crop Production and Rural Environment of the University of Thessaly.